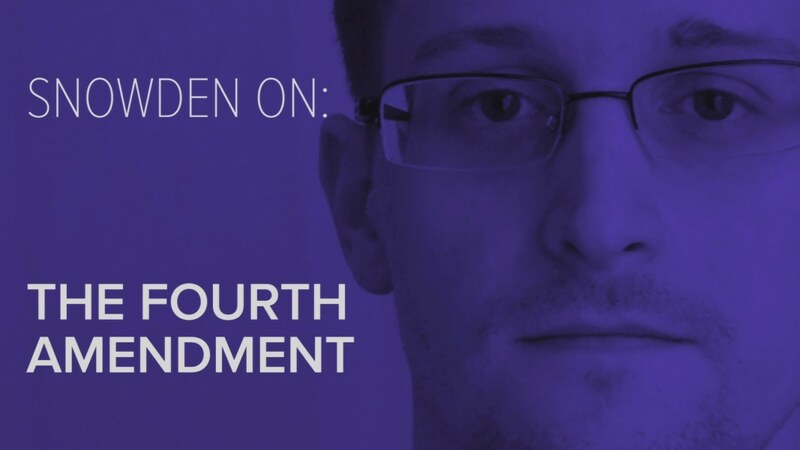 The Fourth Amendment as it was written -- no longer exists. The problem with it -- the reason we have that difficulty is one very specific interpretation that the government has made in secret. And that's that the Fourth Amendment's prohibition against unreasonable search and seizure can be separated. And the government has decided -- again in secret, without any public debate, without anybody in Congress, without the body of our representatives in Congress knowing -- is that now all of our data can be collected without any suspicion of wrongdoing on our part, without any underlying justification. All of your private records, all of your private communications, all of your transactions, all of your associations, who you talk to, who you love, what you buy, what you read, all of these things can be seized and held by the government and then searched later for any reason, hardly — without any justification, without any real oversight, without any real accountability for those who do wrong. The result is that the Fourth Amendment that was so strict -- that we fought a revolution to put into place --now no longer has the same meaning that it once did. Now we have a system of pervasive pre-criminal surveillance, where the government wants to watch what you're doing just to see what you're up to, to see what you're thinking even behind closed doors. The British intelligence service was found to be collecting data from the webcams of individuals around the world who were using the Yahoo service. The problem with that is those webcams are in people's bedrooms. So the government is not just looking outside our houses through surveillance cameras -- through transactions at private businesses that they've asked to share information with government. They've actually moved into our houses. They've moved on the inside and they see what we're doing at home. Now, the question is do they need to know that? You know, anyone can second guess my judgment. And you know, again I'm a human being. I could make mistakes, I could make the wrong call. But the reality is the situation determined that this needed to be told to the public. You know, the Constitution of the United States has been violated on a massive scale. Now, had that not happened, had the government not gone too far and overreached, we wouldn't be in a situation where whistleblowers were necessary. I think it's important to remember that people don't set their lives on fire, they don't say goodbye to their families, actually pack up without saying goodbye to their families, they don't walk away from their extraordinarily comfortable lives -- I mean, I made a lot of money for a guy with no high school diploma -- and burn down everything they love for no reason.